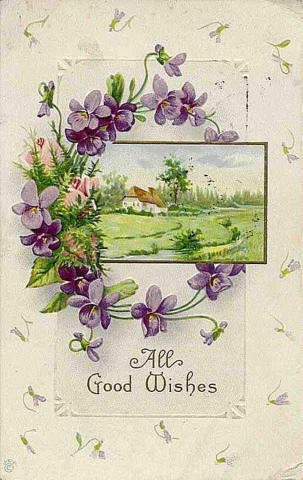 Vintage cards like this, with the scene inside a wreath of flowers, give me ideas for water color. Every year when the violets cover the lawn like a scented cloth, I think of making a garment to go with, but I never quite achieve it. I think about it, sketch a design, color it, and look for fabric. 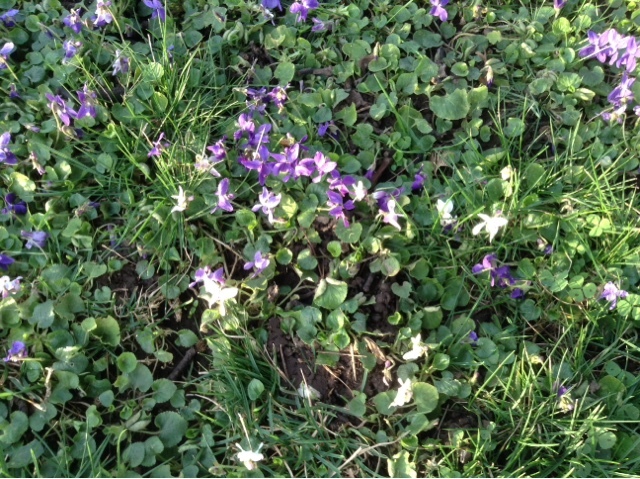 The idea, of course is to sew the dress or skirt in time to have a picture taken standing in the field of violets. Usually the violets disappear while I am still forming the plan in my mind. 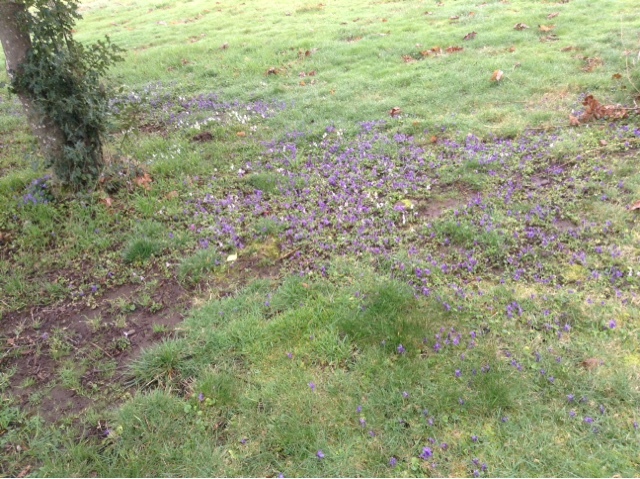 Yesterday the violets appeared (usually after a very foggy, overcast period) but again, I was not prepared. Some paintings by Catherine Klein are interspersed throughout this post. 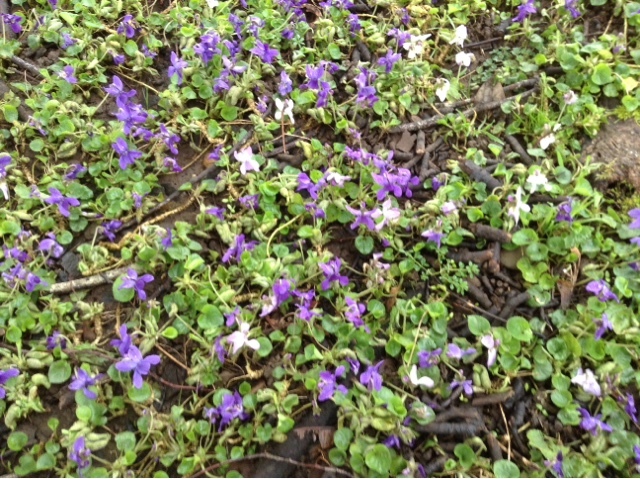 Mr. S., thinking of mowing the grass, noticed the violets and took me out to see them. He always hears of my ideas-- well of course he does-- I'm in and out of his office all day telling him something, which I am sure he is interested in 😊-- and so he offered to go hunting for violet fabric ("Let's go look for some of that 'violent' fabric," he quips) and this is what we found at Walmart fabric department: (The cup is from Goodwill). 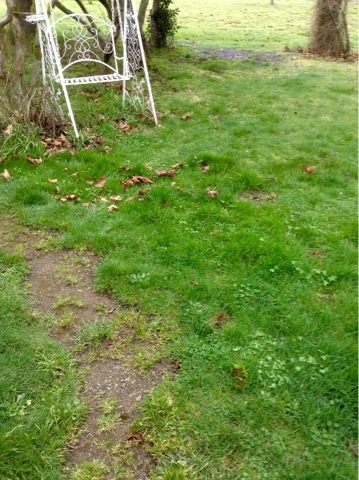 In deference to me, and because of the appearance of the violets (so he says), Mr. S. Is not cutting the grass yet. And I was told he couldn't take me to a fancy tea room so he would stop and let me find a tea cup at the Goodwill. 😊. You girls realize we joke around a lot. One time there was a meeting my husband wanted to attend. We had been going and going and I finally needed to get the kitchen cleaned and catch up on so much, that I bowed out . Someone asked where I was, and he answered, "she didn't finish her work to do at home. If she gets her work done, I will let her come next time." Well you can imagine the small-minded person who asked about me did not see the humor and went tale bearing all over the place about how Mr. S. kept me locked away working all the time at hime and would not allow me to go anywhere. That's just Mr. S. dry humor, ladies. This is all cotton with a silky feel and linen look, by a company called Rose and Hubble. I didn't look at the top of the bolt to see the name of it, but I quite like the way they name prints and solids. Seaside and Glacier, Primrose and Ballet, etc. I always think one should have a dress and a tea cup to "go with" the current scenery, whether at home or traveling. And, if you paint, it's a delight to get your little paint book out and make another page, with the current date, while wearing a violet blouse and keeping your violet cup in view. Going to the seaside? How about a sea shell print from the fabric store and a matching bag for your. sea side tea cup. We will try that one later. 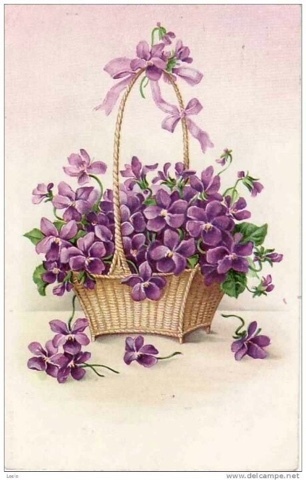 Well, ladies, today I am putting all the crazy "issues" away and all the controversy and inner conflict with life outside the home, to enjoy a special week of blooming violets by sewing something to go with. I think it is ever so soothing to enjoy this sort of thing and when my children were growing up we had colors and foods and activities to go with whatever was blooming or whatever the weather. Remember my foggy day teas in previous years, and the things I sewed to go with? This is a mismatched cup and saucer, but I know if I keep checking our local thrift stores, the mates will turn up, like a few others in my China cabinet. 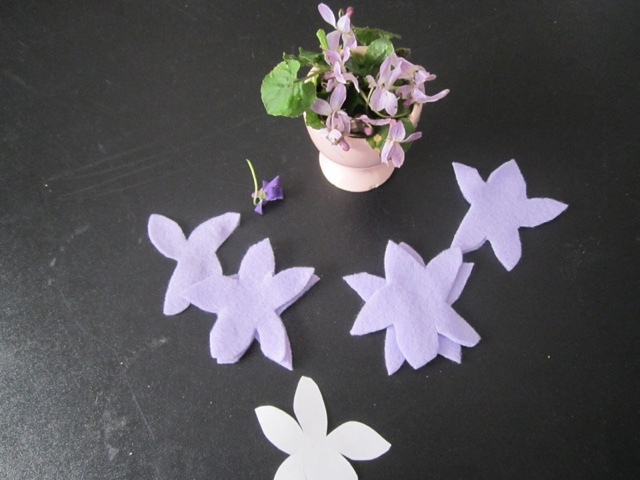 It would also be nice to make a little violet brooch to wear. What do you think? These days I have been using Velcro to back brooches and corsages, instead of pins. Just about the time some of us were getting overly gloomy from the cold and dark weather, God sent us a carpet of violets, and not only that, but it enabled us to get ideas and start enjoying violet season in many different ways. I think I saw somewhere people were making violet tea. Let me tell you more about Mr. S. There is a shop he likes near the area where I go hunt fabric and he was wanting to go there too. However he will help me find fabric, and I know of several husbands who make the perfectly engineered templates for their wives quilting squares. Mr. S. likes cars, so of course he is going to find a fabric store near the area he also wants to see....no use wasting a trip, you know. When you see violets in the spring, or anything new in any season, it's a great influence for your children to hear you appreciate it. 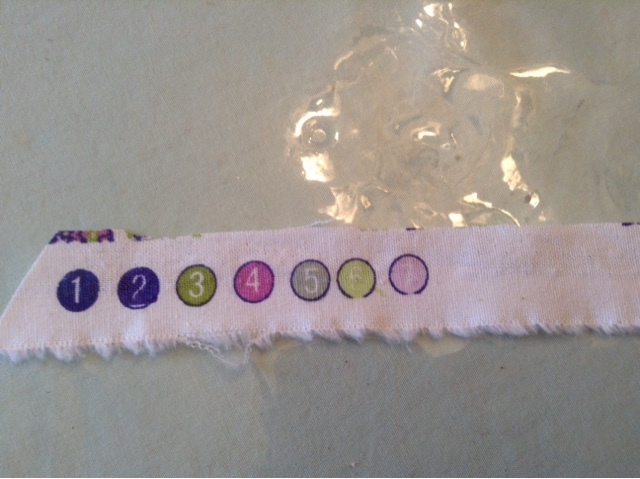 On the selvedge of fabric there is usually a color code strip that shows the color of threads that went into the print. I cut this off and put it in my wallet to use for choosing other things like a jacket or cardigan, shoes, fabric dyes, art supplies, tea cups, florals for making fascinators. That is not to say I always do all that, but it is nice to have that handy little color strip. 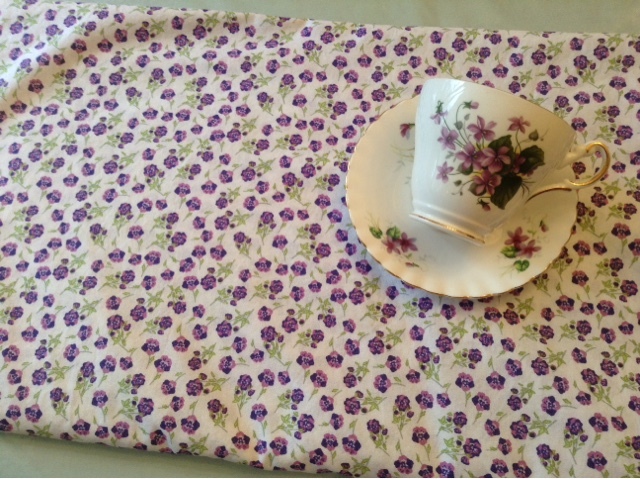 The fabric looks like a good tablecloth for a viola tea. I may find as many coordinating cups as I can and host a little February tea. Since I use plastic on top of all my table cloths, I could use this fabric before I sew it. And yes, the print is pansies, not violas. 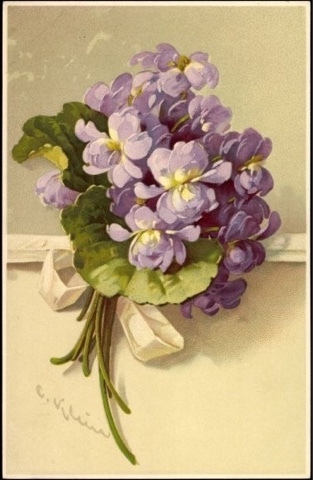 The flower for February children is the violet. I always fill a tin with candied violets when they appear. I use them on cookies, cupcakes, and cakes for my February baby. She will be 46 in a few days. The violet fabric you bought is beautiful. I look forward to seeing what you create from it. I love the scent of violets,but the wild violets that grow in my yard have no scent at all, but they are still beautiful to me. I can't imagine that some people consider them to be weeds with their pretty flowers and bright heart shaped leaves. I have a lovely tea cup and saucer that I bought at a thrift store. It is strictly a collectible, because it has a warning on it that it is not to be used for food or drink. Silly, a teacup and saucer not to be used for tea. 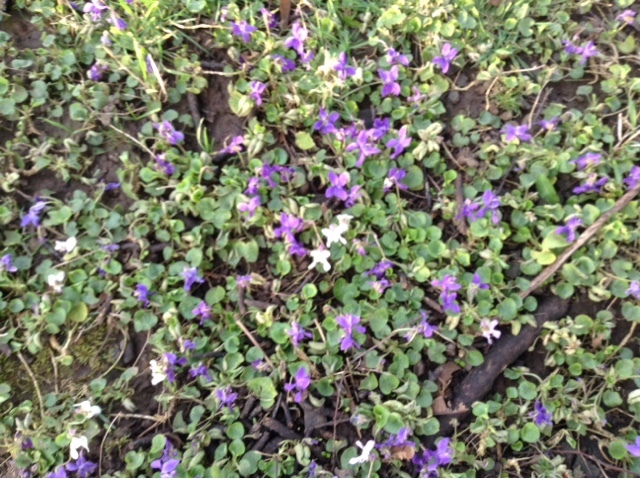 When I see violets I think of my mom whose birthday was Feb 1st. She loved the color purple. 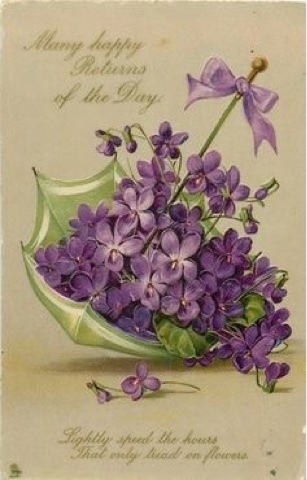 I love your choice of fabric and the fragrance of violets. Perhaps a solid purple fabric trim to go with a dress of your violet fabric? You would look stunning in purple. What a wise thing to carry the color code of fabric in order to find "go with" thread, fabric or accessories! Thank you for sharing this tip. Pretty fabric, pretty cup, pretty pictures. We need a lot of pretty right now to combat the gray, rainy weather! Lydia, I'm amazed there are violets for you to enjoy in February. My little one and I are eagerly searching for the first shoots of crocus. They should be appearing soon, and his eagerness, which feeds off of mine, is endearing. The violet fabric you selected is lovely, and thank you for telling us about those numbers. I always wondered about that! 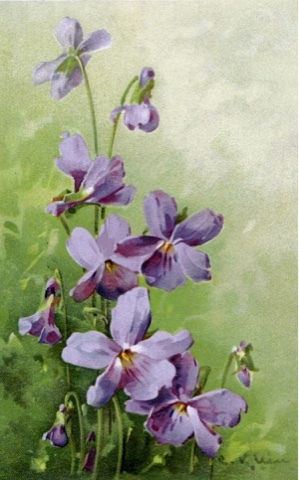 I've always loved violets. It's a sad day when the first mowing of the Spring cuts them all down. I've never noticed any scent from the violets that grow around here. Now I feel like I'm missing out. :-) Enjoy your violets while they last. I love your creativity and whimsy in thinking of a dress to match the violets in your yard and your tea cups. I think it's brilliant that one can use the color circles on the selvage to match and coordinate accessories to the fabric. You are so smart to have figured that out. I too am astounded at your having flowers growing out there at this time of the year! We are covered in snow today...it snowed most of the day. The fabric is lovely. That teacup and saucer are beautiful. 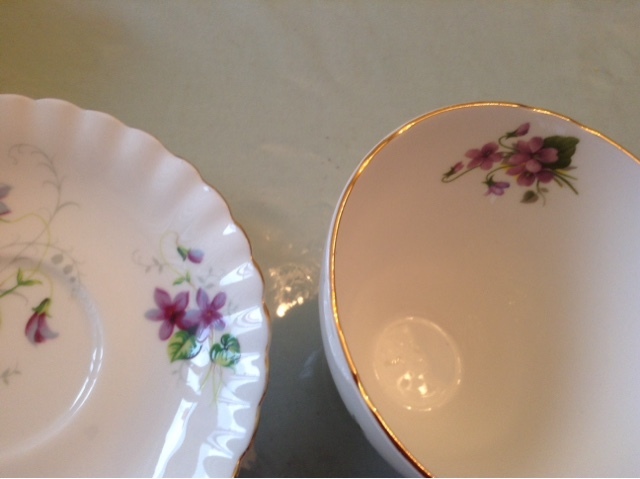 I look every time I go to our thrift stores for pretty teacups. All I find are mugs. Mugs are fine to drink my coffee out of in the morning, but I would rather have a pretty teacup for my afternoon tea. Right now, I have one. It is a blue willow teacup and saucer one of my sisters gave me for my birthday years ago. I will keep searching. Being from the South, I grew up with sweet, iced tea year round. It wasn't until I become an adult did I discover the pleasure of a cup of hot tea. Now, we all drink it. My husband prefers peppermint. I will drink just about any kind. Even my four year old grandson likes hot tea. Anyway, thank you for a bright spot in this very cold, gray winter we have had. I do enjoy the cold weather, but I do like the flowers too. I can't wait to see what you make with your fabric! Those drab days can deeply affect people, and as I learn more about the social life of the Victorians and previous decades, I get a glimpse of how they coped with it, and that is what I am trying to do on this blog. If you can find Australian blogs, it is summer there and reading their sites can bring some relief from the gloominess. I love violets! Thank you for sewing tips. I haven't read your blog in awhile and I need to catch up on my posts. I enjoy your YouTube channel also. Please keep making videos! Yes, deadpan delivery of the Mr.S. quips! We had the tiny little Johnny Jumpups in our yard in Northern California. I made sure the mower was set to cut above them! It's difficult to find yards with these treasures in them nowadays. Most people work so hard to have perfect grass and such naked looking "flower beds". 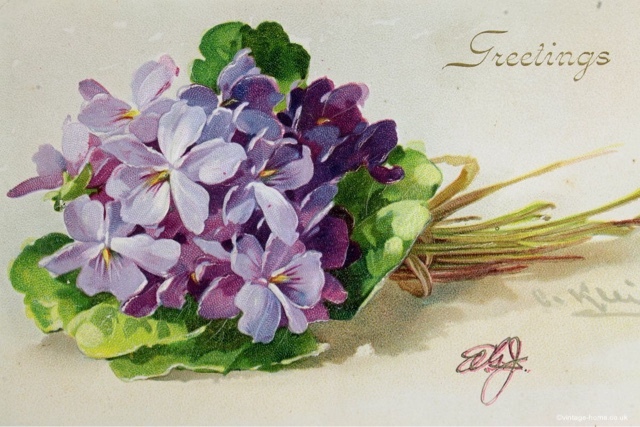 Dear Lydia, I love violets, the flower is so small yet packed with a sweet aroma, and the color is so bright and cheery! 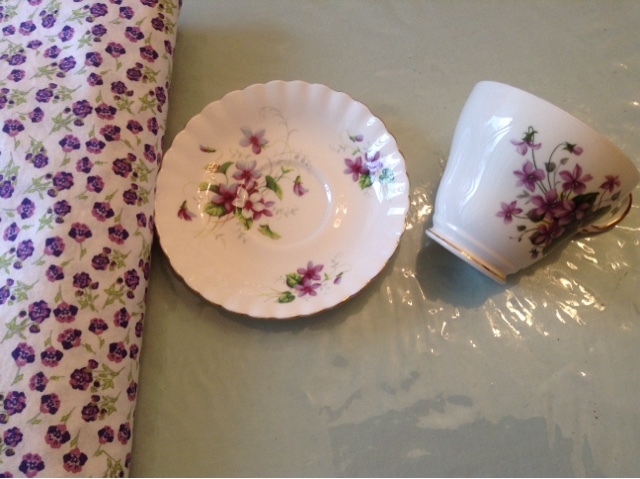 I have a very small teacup that I used as a child with violets on it! I may just need to find a few photos I may have of them and do a blog post or add them to my sidebar so everyone can have a peek! You have a good husband and he is really very funny and witty, might I add!! I so enjoyed the violet theme ~ they are one of my favourite flowers. Adore the fabric! 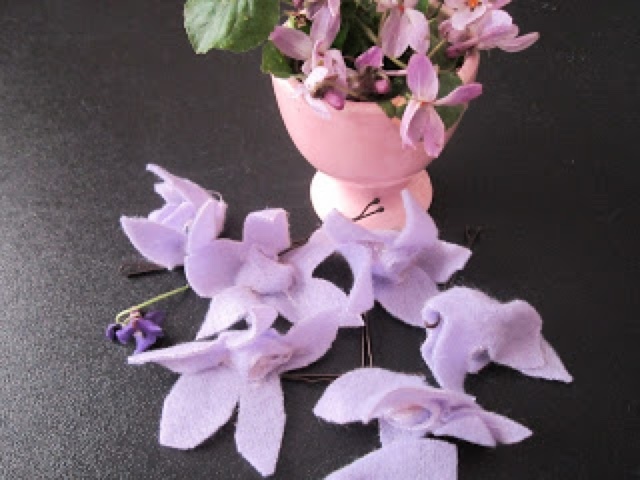 Maybe you might find a deep violet satin ribbon to trim whatever you make. 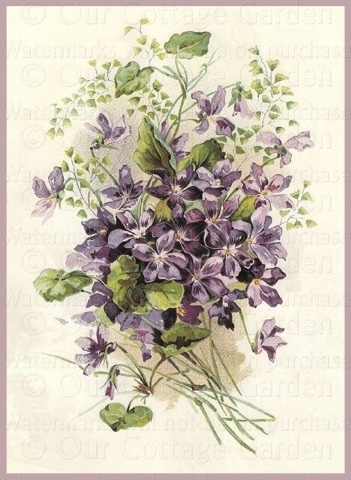 In England get violets more in March than February ~ not too long to wait now! Their scent is elusive, but when you can smell it... oh so sweet. When I was a child you could get tubes of little round chalky sweets called 'Parma violets'and even my mother (now passed away) could remember those, and she was born in 1919. Alex, the artists paintings show the violas in vases and bouquets. I don't know how that would be done. The flower grows short and close to the ground. When picked, there is barely any stem with which to gather. So maybe there is a different strain of the violet/viola than I am dealing with. 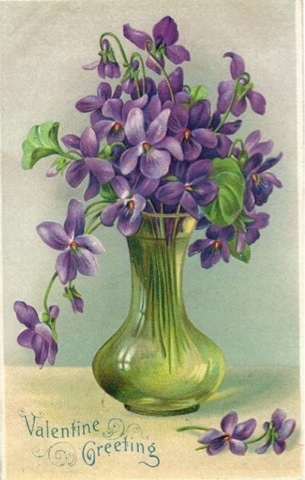 The commercial florists have started including some wildflowers, such as Queen Ann's Lace and wild clover, in the bouquets I see at the grocery store, but never violets. Also, commonly grown only in home gardens, flowers such zinnias and daisies are now being sold in the commercial bouquets, but not violets. I don't know how they could be picked. The stems are not long enough. 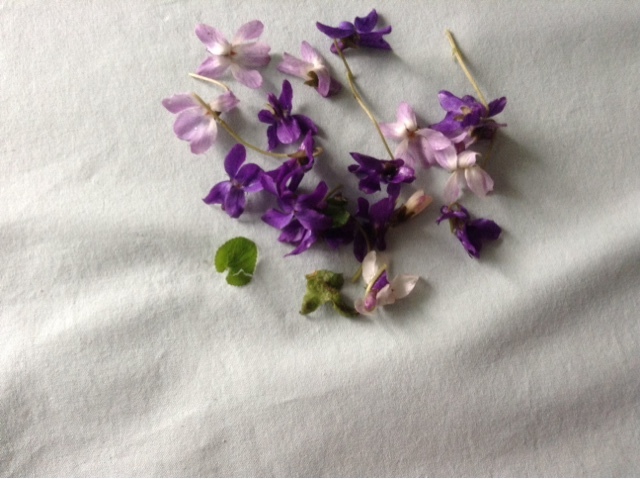 I did a one year course in Floristry and we were told the only true violets were wild ones...all others are hybrids. I think yours look similar to ours that grow under hedges in the countryside here. Their stems are very thin, frail and short and they can only make a very transient sort of tiny posy, but then that is their charm, isn't it? It helps them to last if you first soak the entire flowers (cut) in a bowl of water somewhere cold overnight. That's called 'conditioning'. I once put a tiny posy of these on my Mum's grave...though I knew it wouldn't last, it felt very sweet.